Maslenitsa (Shrovetide), a time to say ‘goodbye’ to winter and meet spring, is one of the most loved holiday in Russia. The holiday came to us from pagan times. Presently, it unites Old Slavic traditions and western carnival celebrations. 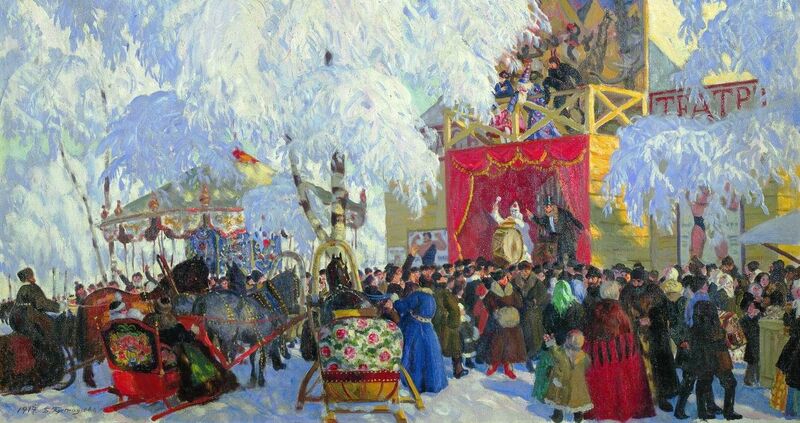 The Orthodox Church dates Maslenitsa to the Lent – the festive events take place in a week before its beginning and in seven weeks prior to Easter. Our ancestors tried to embody the image of the Sun, the main symbol of Maslenitsa, in dishes of a round form, such as flat cakes and pancakes. This food is supposed to give a part of warmth and force of a heavenly body to those who eats it. Now Maslenitsa cannot be imagined without pancakes, prepared with a lot of various stuffing, as well as fairs, festivities, contests, games and performances. In past times, every day of the holiday had its own name and was carried out in a special way. Monday was considered as day of a meeting. People started preparations for the fest and began cooking pancakes. The first pancakes were traditionally given to beggars. On Tuesday, there were ‘zaigrish’ (start of merriment). Youth enjoyed winter fun; friends and relatives went to visit each other, tasting pancakes. Visiting guests proceeded on Wednesday — ‘luckomky’ (tasting delicacies). This day, a mother-in-law waited for her son-in-law to a home feast, as well as the other relatives. Thursday was called a ‘broad revelry’. There was atmosphere of fun. Various entertainments took place everywhere: riding in sledges and on horses, carnival performances, fisticuffs and jumps through fire. On Friday, sons-in-law waited for mothers-in-law of response visit. On Saturday, daughters-in-law and sisters-in-law went to see each other with gifts and treats. Maslenitsa comes to the end with Forgiveness Sunday. This day everyone apologize to each other even if there were no quarrel. In addition, on Sunday, Maslenitsa effigy symbolizing winter is burnt. Practically every Moscow park prepares a special Maslenitsa program. Culmination of the festive events in Moscow is awaited on the weekend, February 21 and 22. However, some of the places celebrate Maslenitsa throughout the week. GUM invites everyone to Maslenitsa Fair from February 16 to 22! During the Pancake Week there will be performances of circus actors, songs, dances, national entertainments and, of course, pancakes! 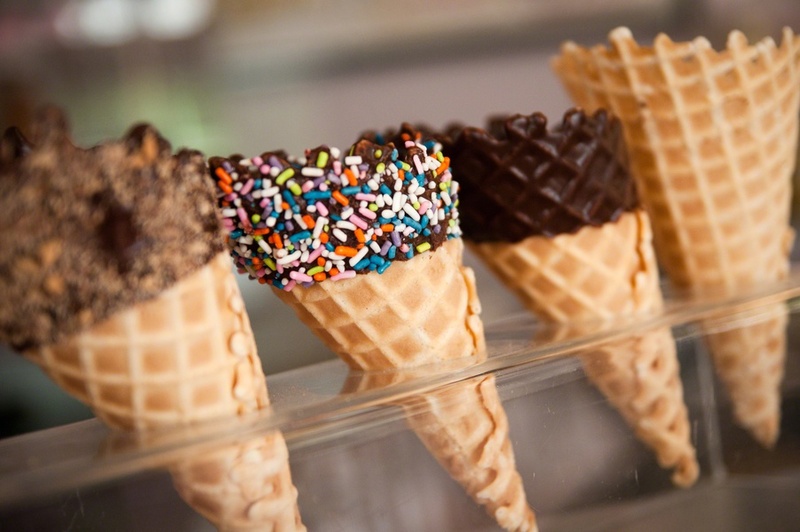 They will be made according to the ancient recipe, supplemented on your taste with honey, sour cream, caviar, jam or oil! At the GUM Fair near the Kremlin walls, visitors will be able to buy warm socks and mittens, Gzhel, nested dolls, valenoki and samovars, zhostovsky trays, Orenburg and pavlovoposadsky scarfs, Khokhloma, Klimovsk and Dymkovsky toys and other national souvenirs. Fans of active lifestyle will be able to enjoy ice-skating at the renovated GUM skating rink. On the weekend the main celebrations will take place at Vasilievsky Spusk. There, the Maslenitsa effigy will be burnt. A shopping street, decorated with bright tapes and spring birds will be built at Kuznetsky Most Street. The most unusual pancakes will be cooked here. Participants of the ‘pancake fair’ promise to prepare more than 50 types of stuffing and to bake about 40 thousand various pancakes. During the Pankake Week, an action ‘The suspended pancake’ will take place at Kuznetski Most. Everyone will be able to participate in it -it is enough to pay for one excess pancake and leave it for a passerby. Very interesting action will take place in the Gorky Park on February 21 and 22. There will be the biggest pancake fair in the city! Pancake week celebrations will capture all Pushkinskaya Embankment. Here, seven farmsteads will settle down, each will be issued in its own special style. The main action will happen on a theatrical stage, which will appear in the center of the fair. There will be comic presentations and performances of national collectives, competitions and games. In the center of the fairground, there will be a ‘Force Place’, where the international tournament of strongman of Moscow «IceMan» will pass. The Mgzavrebi group will become a headliner of the traditional concert. 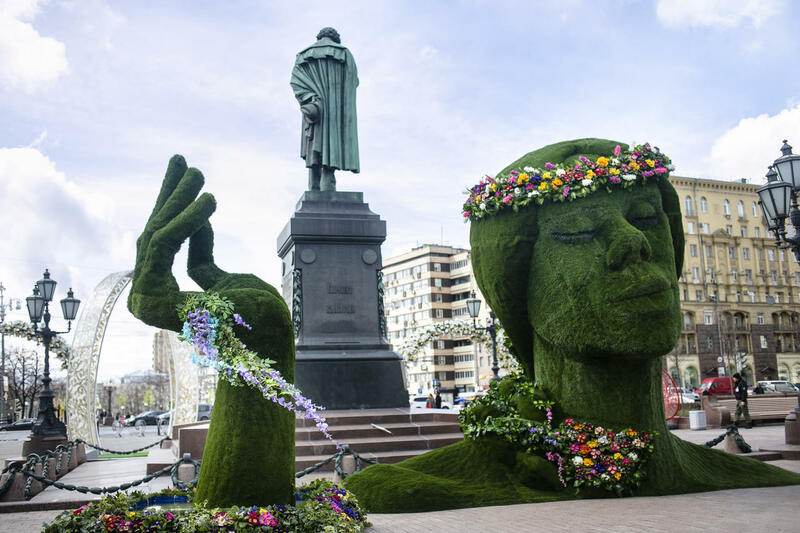 Instead of a traditional Maslenitsa effigy, the park will establish an art object «A Hostile Cloud» – everyone will be able to leave a note with the negative thoughts on it. On February 22 at 20.30, the central event of a holiday will start— burning of the ‘Cloud’ will take place. The square of Patriarch’s ponds will be turned into a spring gallery for the period of the holiday. The traditional understanding of Maslenitsa as farewell to winter and a meeting of spring will be broadcasted through images and perception of classical artists and composers. The group of actors will present ‘tableau vivant’ on plots of known works of art. Loudspeakers round Patriarchal ponds will transmit music of Tchaikovsky, Rimsky-Korsakov, Vivaldi, Schuman and Mozart. 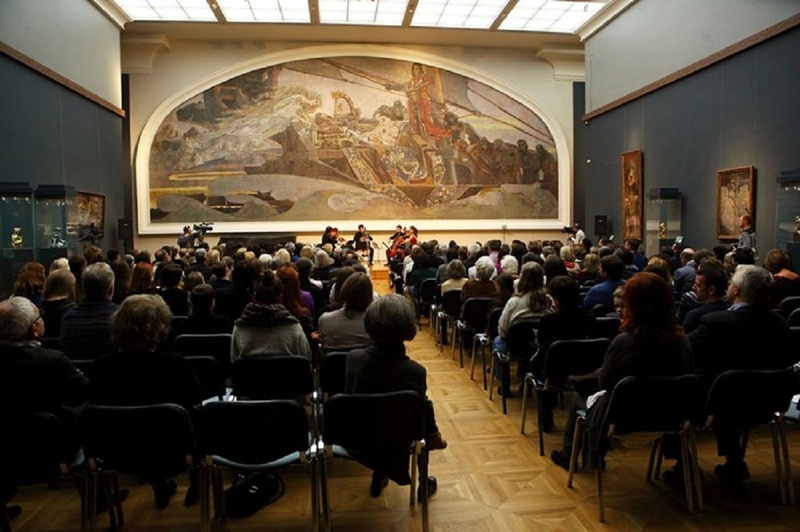 Visitors will learn stories of creating famous pictures: Savrasov’s «Rooks flied», Perov’s «The thawing Snow Maiden», «Spring — the blossoming garden» by Malevich, Yuon’s «The March sun» and «A spring sunny day», Kustodiyev’s « Maslenitsa», Levitan’s «March» and many others. The reproductions will be established right there, on bright easels. Maslenitsa on Patriarch’s Ponds will not do without pancakes: you will be able to taste numerous variations – from classical Russian pancakes to French crêpes. The celebration will take place on February 21 and 22, from 13.00 until 18.00. The Muzeon Park invites everybody to traditional family celebration of Maslenitsa. On February 21 and 22, Krimskaya Embankment will become a place with bright street festivities with buffoons: songs, dances, folklore chastushkas, poteshkas (little fun Russian songs) and dance tunes. The workshop of transformations will help you to dress up in print skirts and kumachovy shirts, to decorate yourself with cardboard kokoshniks and papakhas, to fasten a caftan, make rosy cheeks and join a multi-colored carnival. You will try viands from the exotic countries and please yourself with unusual souvenirs at the Overseas Market. Of course, it will not manage without traditional snack pancakes. On Sunday from 13.00 until 17.00, there will pass an interactive fancy-dress street program with live music, outdoor games, ancient entertainments and folk theater «Parsley». The symbol of the leaving winter made from a huge balloon will be started in the sky.